Los Altos Elementary was ranked 60 out of 10,000 schools in California for their growth on their California Assessment of Student Performance and Progress, or CAASPP, scores for 2018. 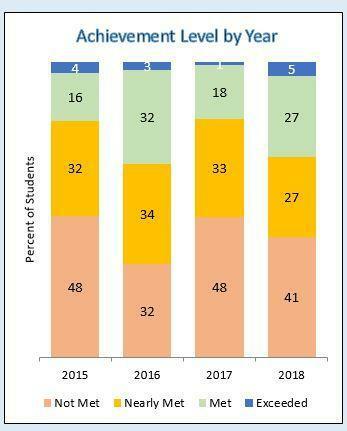 Los Altos only has one grade, their 3rd grade class, that participates in the CAASPP testing being that their site has Pre-K through 3rd grade. They saw exceptional growth in both their English Language Arts, or ELA, and their math scores. Their ELA scores saw growth of 19.48% and their math grew by 12.59%. "Los Altos has only one grade level that is assessed on the annual CAASPP test, and their third grade teachers should be applauded!” Stacy Ayers-Escarcega, Director of Assessment, Accountability, and Parent Engagement, shared. “When comparing scores to the previous school year, the amount of growth ranks them in the top 60 out of 10,000 schools in California for their ELA scores and in the top 240 schools to make the most growth in Math!" Principal, Genevieve Silebi, explained that Los Altos worked very hard to help students succeed by focusing on reading, writing, and reasoning. “At Los Altos, we worked really hard in writing performance tasks this year,” Silebi shared. “Students were asked to close read complex text and write to a prompt. Students were taught to find the main ideas and key details of text to support their responses. In math, we began daily number talk routines to support students to be able to explain their mathematical reasoning." Great job Los Altos Bulldogs! South Whittier is proud of you!